The Holbrook Chamber of Commerce recently hosted their annual carnival weekend, for which hundreds of friends and families gathered for the festivities. Holbrook, NY - August 24, 2015 - The Holbrook Chamber of Commerce recently hosted their annual carnival weekend, for which hundreds of friends and families gathered for the festivities. This year’s successful Hawaiian weekend started out with a bang, a late-night fireworks show and plenty of fun for the whole family. Legislator Bill Lindsay III was the sponsor of this year’s entertainment, which showcased a wide variety of performers and musicians. The Hawaiian themed carnival also provided an array of quality craft vendors and plenty of exciting rides for adults and children. 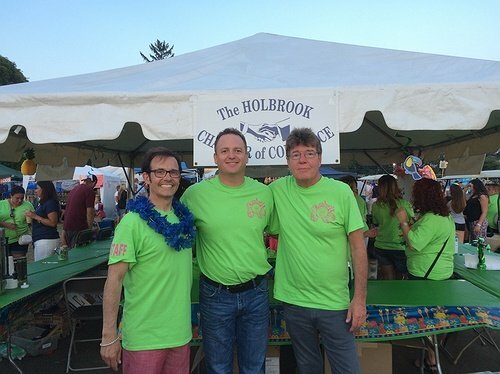 Pictured: (from left to right) Holbrook Chamber President, Rick Ammirati, Suffolk County Legislator Bill Lindsay III, and Holbrook Chamber Vice President, Kevin Guilfoyle at the Holbrook Chamber’s annual Carnival. Tyrell Carrillo, Sr. Joins Long Island African American Chamber of Commerce, Inc. Regional Chamber of Commerce LIAACC Joins US Black Chambers, Inc.
Subject: LongIsland.com - Your Name sent you Article details of "Holbrook Chamber of Commerce Carnival/Festival"